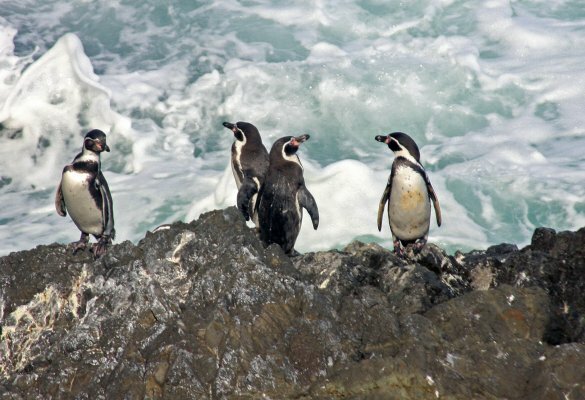 Located less than 40 kilometers from Punta Arenas, the island has more than 60,000 penguin couples, a peculiar fauna in this Natural Monument. The Natural Monument was named by the penguin colonies that have chosen this spot as their home. Attractions: Austral fauna, magellian penguins, also known as Spheniscius Magallanicus. Activities: Flora and fauna contemplation, photography, sea kayak. How to get there: Tres Puentes Pier-The Penguins Natural Monument: Seaway. When to go: January, February, March, October, November, December. Weather: Cold moderate rainy weather, without dry season but with microclimates. The annual media temperature is 8°C, meanwhile during summer time the temperature goes from 10° to 18°C. The annual media rain is 450 milimiters. Services: Information center, forest ranger. Surroundings: Froward Cape, Punta Arenas cementery, de la Cruz Hill, Pali-Aike cave, El Salto, Magellian Strait, San Isidro lighthouse, Bulnes Fortress, Pali-Aike National Park, Punta Arenas, Magallanes National Reserve, Otway Inlet.